Recently, I hitchhiked in South Korea and it was a safe and pleasant experience. 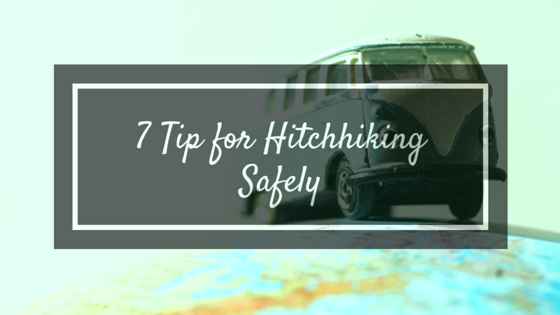 I am not recommending that you hitchhike, but if you do, please read my seven tips for hitchhiking safely. Do not hitchhike at night and always use good judgment. Know the city and country you want to hitchhike. Do not spontaneously hitchhike in a city you nothing about. Also, if a car stops and you do not feel safe, then you should firmly decline the ride. If you are planning on hitchhiking, then pack a pepper spray. Back up all your traveling documents and have contacts for banks, in case things sh!t go left field. Have extra batteries or a portable charger for your phone. If you are tired of hitchhiking, you can just call uber, purchase tickets and make other transportation plans. Once you have made the decision to hitchhike, then you should make a sign. Make sure it is legible and put a little personality and creativity in it, even if it is just one work. Chances are if you look homeless, you will have a lower chance of getting picked up. Even if you are not clean, just look clean. Wear a smile on your face when you are out there. If I was hitchhiking on the regular, I would map out my routes. You don't want to be stuck in an isolated area. Choose great pick-up and drop-off points. Know exactly where you are going. This will avoid any confusion and having your driver go out of his/her way. This is so important because if your are overpacked with a suitcase and two bags, the chance of someone picking up just decreased. Also, pack an umbrella, hat, sunscreen and raincoat. I would not pick someone up if they were soaked wet, so I would never expect them to pick me up soaked wet. Pack light, but remember all the essentials. Do not over talk your driver to death. Follow their lead and let the conversation flow naturally. Have some mints handy and whatever you do, do not smell funky. They will soon regret picking you up and kick you out as fast as possible. Also, keep the conversation light and positive. No one wants a Debbie downer in their car. Read about my experience hitchhiking in South Korea, HERE.